TELL ME MORE ABOUT THE SPORT OF DRAGON BOAT RACING! Racing dragon boats began on the rivers of ancient China some 2000 years ago. It became an organized international sport in the 20th century. Its arrival in North America is very recent. While it is very well established in Canada, it is still getting started in the US. 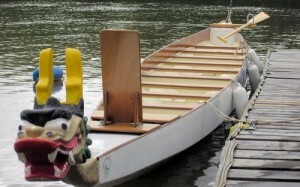 The standard dragon boat is 40’ long, with ten seats for 20 paddlers, a standing steersperson in the stern with a long wooden paddle, and a seat for a drummer in the bow. The boat has a dragon head and tail that are detachable. There is now a 10-person version that is 30’ long. Dragon boat racing is one of the fastest–growing water sports in the world. The paddling technique is very similar to that of outrigger canoe paddling, and involves the entire body in the stroke, emphasizing the larger muscle groups. Committed paddlers train all year round in gyms and in dedicated paddling tanks, regardless of the length of their outdoor season. Our upstate New York season is roughly mid-May to late September, depending upon the weather. There are racing festivals throughout the region, some for community teams assembled just for the event, which is normally to raise funds for a cause, and some with community and sport divisions (the latter allows for the accumulation of points in order to progress to larger regional, national and international competitions). Venues include Poughkeepsie and Ithaca, NY; Burlington, VT; Springfield, and Boston MA; Hartford, CT; and Montreal and Ottawa just across the border. The sport offers racing as women’s, men’s, mixed and BCS teams. The first three are also divided by age: under 24, Premier (usually 20’s and 30’s), Senior A (over 40), Senior B (over 50) and Senior C (over 60). One of the many great things about the sport is that you can do it for your whole life and NOONE will tell you are too old! Dragon Boat training camps are becoming more and more popular. There are a number of them in Florida and the Carolinas during the spring months, and a new one in Cajun Country, Louisiana in March. In-season there is a racing camp in Dartmouth, Nova Scotia for all levels. These camps are not expensive, and they offer 6 days of intensive training, sometimes with a racing festival on the last day. The coaching is usually world-class, and they welcome all levels of paddlers. Steering and coaching clinics are offered in Montreal during the winter and spring, where there is a paddling tank for off-season training, and occasionally on Lake Champlain in Burlington, VT in the summer. Call our coach: Louisa at 518-429-4908. Please do let us know if you are planning to attend a Try-Paddling Tuesday event.